Jemisin’s introduction is particularly useful, as she looks back over her authorial journey (so far) and provides tidbits about which stories collected here are interrelated, or perhaps were written in response to other authors’ works, or are connected to her own work, or are “’proof of concept’ stories,” as she puts it, “to test-drive potential novel worlds.” It’s a brief essay, but it gives new readers an idea for what they’re in for, and returning readers will surely appreciate Jemisin’s insight into her process. The collection begins with “The Ones Who Stay and Fight,” a direct response to Ursula K. LeGuin’s “The Ones Who Walk Away from Omelas,” a classic story which always frustrates me despite my awareness of its significance within literature. Jemisin’s modern take on a potential Utopia, and the cost of keeping its citizens safe and happy, is far more satisfying to my mind because of its co-mingled anger and hope. This is Um-Helat, after all … This is not Omelas, a tick of a city, fat and happy with its head buried in a tortured child. … So don’t walk away. The other story-in-response is “Walking Awake” (previously reviewed by Kat), which provides another point-of-view within the universe of Robert A. Heinlein’s The Puppet Masters. Sadie works in a transfer center, where children are raised and educated through adolescence until they are chosen to be the new recipient of a Master. Sadie has “a defect” that renders her unsuitable to receive a Master, and her work at the transfer center was fulfilling until she dreams, vividly and repeatedly, of a young man who recently was given over to a Master, and the truth of her world is revealed to her. Even without the Heinlein context, “Walking Awake” is a scathing repudiation of anyone who blindly (or willingly) works to uphold an oppressive society, and it’s certainly better than the source material. Fans of THE BROKEN EARTH trilogy will be glad to know that “Stone Hunger” is included in How Long ‘Til Black Future Month?, featuring a single-minded young woman who encounters a key character from The Obelisk Gate and The Stone Sky. I’d read this one before, but was glad to read it again; if you haven’t read that series yet, this would be a great place to start. And I haven’t read the DREAMBLOOD duology, but after the bittersweet tale that is “The Narcomancer” (previously reviewed by Ruth), I’m eager to rectify that shortcoming on my part. The imagery and language in this story swept me away, with equal measures of kindness and pain, and I love the ways in which Jemisin tests the limits of her characters’ resolve. A story which captivated me, because I had absolutely no idea how it was going to end, even to the last paragraph, was “Red Dirt Witch.” Emmaline has three children, two boys and a girl, and her daughter shares Emmaline’s talent prophetic dreams; those dreams and a “colorless, genderless” spirit warn Emmaline that a White Lady is coming, and such visits never bode well. As is typical of the White Lady’s kind, she wants to make a bargain, but Emmaline knows full well that such bargains never work out as claimed. Her daughter, Pauline, however, is young and headstrong and brave, and inexperience is how mistakes are made. “Red Dirt Witch” is suffused with the hurricane-strength of a mother’s love and all its complicated aspects, sometimes requiring harshness and bitter sacrifice in order to see future generations have access to better opportunities than their predecessors. “The Trojan Girl” was previously reviewed by Terry; this story is part of a pair, along with “Valedictorian,” which explore a technologically advanced future and the rising conflict between old and new forms of life in the first story and, in the second, the shift in “normal life” after that conflict. While the idea of new life realizing its full potential was intriguing, I thought “Valedictorian” was slightly more successful in conveying its primary character’s struggles and the strange-yet-too-familiar world she lives in. 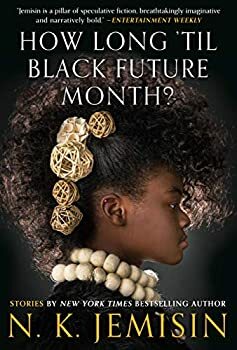 In trying to make a list of the stories I enjoyed the most, I only succeeded in writing down the majority of How Long ‘Til Black Future Month?’s table of contents, so that idea went out the window. This collection amazed, astounded, chided, entertained, prodded, and terrified me. Jemisin’s work is thought-provoking, wildly imaginative, and profound. I can’t recommend this highly enough, and I’m eager to see what she puts her talents to next. Published in November 2018. Three-time Hugo Award winner and NYT bestselling author N. K. Jemisin sharply examines modern society in her first collection of short fiction. N. K. Jemisin is one of the most powerful and acclaimed authors of our time. In the first collection of her evocative short fiction, which includes never-before-seen stories, Jemisin equally challenges and delights readers with thought-provoking narratives of destruction, rebirth, and redemption. Spirits haunt the flooded streets of New Orleans in the aftermath of Hurricane Katrina. In a parallel universe, a utopian society watches our world, trying to learn from our mistakes. A black mother in the Jim Crow South must save her daughter from a fey offering impossible promises. And in the Hugo award-nominated short story “The City Born Great,” a young street kid fights to give birth to an old metropolis’s soul.